Resource and capacity planning for creative work is complex and comes with a unique set of challenges. There is little consistency when it comes to each client’s needs and timelines. You want to utilize creative personnel, but also give them the freedom to be creative. With shifting deadlines and requirements, resource planning becomes incredibly complex. In order to properly plan resources, it’s important to be able to forecast your resource availability. Crude techniques such as ROI scoring fail when it comes to complex creative roles. You need a more nuanced approach to forecast resource need and availability. In this article, I’ll discuss some of the key benefits of resource forecasting. I’ll also share some guiding principles to forecast resources more efficiently. The agency business, at its heart, is a people business. You are only as good as the kind of people you can attract and retain. When you’re dealing with something as nebulous and ill-defined as creative talent, careful people management becomes even more important. Creative people at agencies often shuttle between two states - “overworked” and “underutilized” - neither of which is ideal. Resource forecasting aims to stop this problem. 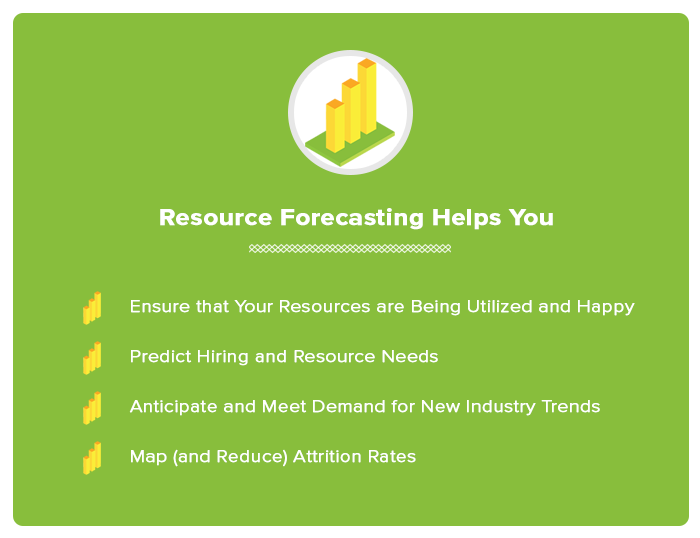 Resource forecasting, as the name implies, is predicting your future resource requirements. For growing agencies, this is vital for allocating resources and planning out hiring. Project managers will use forecasting to ensure that their upcoming projects are adequately staffed. Account managers will use it to figure out what new business to pursue. You can’t plan creative resources the same way you would plan for a factory. Human creativity is ill-defined and fleeting. It is also rarely scalable; creative output varies greatly from project to project and even day to day. Hence, resource planning for creative industries should focus on not only utilizing resources, but also keeping them satisfied. Doing this requires a deep awareness of the strengths and weaknesses of your creative team. You need to know exactly what kind of projects and challenges your people enjoy working on. If you can match the right resource with the right project, you’ll have a much happier workforce. One way to do this is to utilize easy-to-use, user-friendly resource management software. This software will make timesheets and reporting for your team and reduce potential stress. The best resource management software should enable managers to create schedules and manage workloads. It should also integrate schedules and timesheets, allowing projects to be updated in real-time. 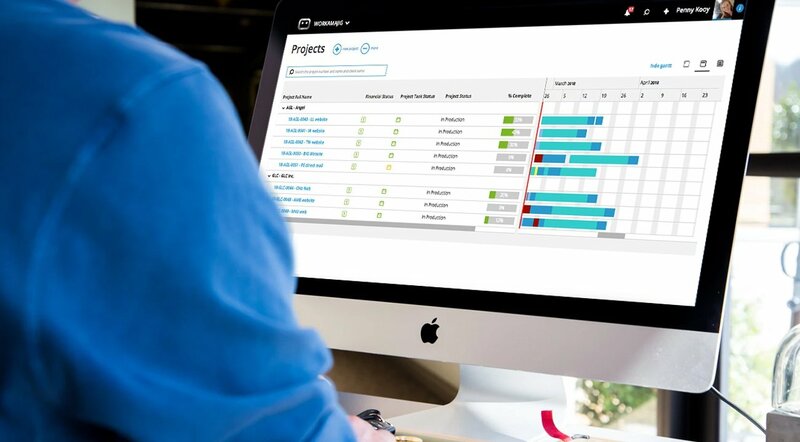 When handled correctly, and by the right tools, resource forecasting can show the strengths and weaknesses of each project—and how resources are being utilized. Resource planning identifies staffing needs, forecasts available personnel and determines what additions or substitutions will be necessary to for future projects. These factors all contribute to a project’s success, and can help provide quantifiable evidence to improve your agency’s processes. When planning for your next project, it’s important to have an idea of your capacity. This can be accomplished by looking at past projects to identify which resources were under or over-utilized. Look for resource management software that tracks and stores all forms, files and emails by client, making it easy to accurately analyze each campaign. In the modern creative industry, it’s common for agencies to utilize outsourced resources. Having a handle on resource forecasting can also help determine whether you’ll need a freelance copywriter or a full-time designer to accomplish what’s in your project pipeline. Technology is a cornerstone of the creative industry, and as technology trends shift, demand for talent shifts accordingly. A programming language or design practice popular two years ago might be out of favor within the next six months. You need to be able to foresee these trends and orient your hiring practices accordingly. This is one of the lesser-known benefits of resource forecasting. It gives you a bird’s eye view of the industry and the market forces shaping it. If there are emerging trends on the horizon, you can factor that into your hiring decisions. At the same time, being able to spot trends will help you develop training solutions as well. It’s not unusual for project managers to collaborate with HR managers to offer team members training for forecasted trends. Key team members jumping ship is one of the more disastrous things that can happen on any project. If you use a more structured project management methodology, such as the Waterfall method, the departure of a resource can derail the entire project. In the process of forecasting future resource, you’ll also have to take a survey of your existing attrition rates (which can be in excess of 20% at some creative agencies). This can help you understand and map the reason for employee departures. Doing this, of course, makes it possible to take remedial steps. If key resources are leaving because they don’t get to work on meaningful projects, you can divert their efforts accordingly. Resource forecasting as one of the most important things you can do at your agency. The question now is: how do you do it? I’ll share some tips below. At its core, resource forecasting is simply a measure of three things - your historical work records, your current team composition, and future work coming your way. A common mistake in resource forecasting is to take a project-level view of future resource requirements. While this will tell you what future projects you need to prepare for, it doesn’t tell how whether your organization is equipped to handle these changes. Therefore, one of the first things you need to consider is the growth of the organization. Ask yourself: how fast is the business growing? Is the business contracting/expanding in a certain area? What is the business’ financial health for supporting personnel changes? If the business is actively chasing new clients for motion design projects, you will have to orient your team accordingly. If poor growth in the last two quarters has impacted hiring capability, you will have to factor it into your resource planning decisions. The departure of key personnel can not only derail your current projects, but also jeopardize your ability to staff future projects. Therefore, factor employee attrition rates into your forecasting. Skill, to see if team members with certain skills are more likely to leave than others. This will also tell you the demand for different skills. For example, if more of your Django developers are leaving, this could mean that they have more opportunities outside your company. Project-type, to check if certain types of projects or clients are more likely to lead to employee attrition. This can help you avoid personnel-project mismatch in the future. Project-size, to check if there is a correlation between the size of the project and employee satisfaction. For instance, if large projects have high attrition rate, it could be an indicator of underlying communication and management issues. You might have the personnel for your existing projects, but it doesn’t always mean that you can meet future needs. New technology trends can often blindside project managers and leave them short-staffed for upcoming projects. Track demand for your existing skills to see how well your existing team will fare in future engagements. If demand for a certain skill is dying out, you can retrain or downsize your people accordingly. Track future market needs to make hiring and training decisions. Client requirements: Estimate future client demands based on your current requirements. Use this demand to figure out resource allocation and hiring needs. Ad-hoc project requirements, i.e. the resource requirements for a specific project. This will ensure that you have the right balance of talent on your team to meet project demands. Ideal buffer size: There will always be a mismatch between what you estimate vs. how long a project actually takes. Use historical project records to identify this mismatch and use it when forecasting buffer size for future projects. There are several approaches to resource forecasting, such as workload analysis, trend analysis, management judgment, etc. Going through all of these approaches is beyond the scope of this blog post. Resource forecasting at an industry or organization-level is helpful, but it doesn’t take into account the unique nature of creative work. Since creative work can’t be scaled like factory work, your forecasting must also be at an employee-level. Essentially, this means forecasting based on the skills and work habits of individual employees. If an employee is known to be brilliant but slow, you need to take that into account. If another employee works exceptionally well on small projects but struggles in large teams, you need to forecast for that as well. Given the people-focused nature of the creative industry, adopting this approach will make for a happier workforce and more accurate forecasting. Your resource planning can either be top-down (i.e. senior management identifies business direction and plans resources) or it can be bottom-up (i.e. project managers identify requirements). For truly accurate resource forecasting, however, you need to adopt a participative approach. This is where top management and project managers come together to plan future resource requirements. Management tells project managers the business direction, and project managers develop a solution to meet their requirements. In dynamic work environments, this participative approach brings much needed clarity to resource planning. It’s inevitable: some resources will leave, some resources will underperform, and some resources will overdeliver. This is a part and parcel of the creative industry. You can never accurately predict how things will actually happen in a project. Therefore, in your resource forecasting, plan for such contingencies. Have plans for worst-case scenarios - what you would do if a key team member decides to quit or if a resource doesn’t perform as expected. Factor in enough of a buffer time to ensure you can deal with issues when they arise. Being a project manager often boils down to bridging the gap between what was expected and what actually happens. The more you can plan for contingencies, the better you’ll bridge this gap. Resource forecasting is one of the most important responsibilities of a project manager. Thorough resource forecasting will make you much better at meeting employee needs. In the people-focused creative industry, this can translate into happier employees working on problems they care about. And happier employees equals happier clients. It is also one of the more expansive activities you’ll be involved in. Accurate resource forecasting requires that you consider organization-level, industry-level and employee-level factors that affect your work. Adopt a participative approach where you bring together top management and project managers in forecasting decisions, focus on employees and plan for contingencies for more accurate resource forecasting. Rod has had years of experience in the video production and IT industries and has worked for companies such as Universal Studios & IBM.